Why do I get a 403 error when accessing my Pronto account? If you got a 403 error after clicking on a Pronto World link (any URL starting in https://app.prontomarketing.com), don’t panic, nothing is broken. In most cases, you will see a 403 error when you have multiple Pronto accounts. Even if these accounts are already linked to each other, you will first need to switch account, in order to access the page which gave you a 403 error. Click on the Go to Dashboard button or on the Pronto logo on the top left hand corner. Once you are back in the Pronto account you are currently logged in, click on your name in the upper right hand side to switch accounts. After you switched accounts, you may click again (or paste in your browser URL navbar) the link which previously showed you a 403 error webpage. In the event that these steps would not solve the 403 error or that your accounts are not linked to each other, you may of course reach out directly to our support team via chat or submit a new support request. 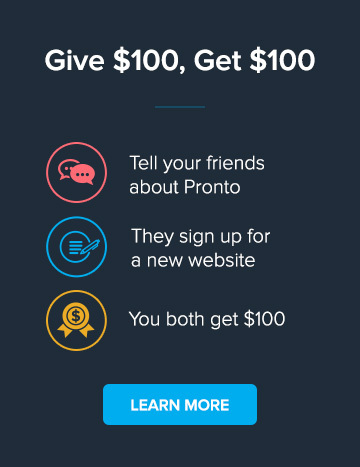 Note: Pronto accounts are linked to each other on a per user basis (ie. by unique email address). Therefore it's possible that your colleague is linked to a second account, but that you aren't. Your user account can easily be linked to another company account by simply adding you to this second account. This can be done by any admin or owner user already on the account, or our support team.